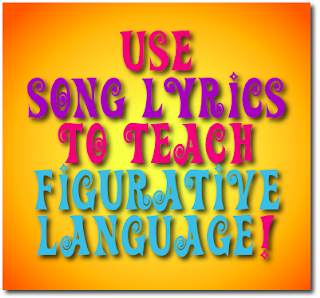 Song lyrics are perfect for teaching figurative language! To engage your students, you need to know what they like. What books do they like to read? What movies do they like to see? What do they do in their free time? What kind of music do they like? Having a questionnaire at the beginning of the school year is a great way to find out more about them. I like to have them create a collage mobile with their answers (more on that in another post). But this allows me to gauge what their interests are so I can create lessons that will, hopefully, engage them. One of my favorite lessons for teaching figurative language & poetry devices is using popular song lyrics. I play the song for them in class & let them listen to the lyrics. Then I give them the handout and play the song again. As they listen, they pick out the devices they see and hear. I have been known to play a song three or four times (with all apologies to my nearest colleagues) so students can find all the "sound" devices. I use this lesson (scroll down) for Katy Perry's "Firework" as one example. Depending on the level of your students, you may want them to find additional devices/examples or fewer. I use this with grade 10 and most were able to find at least 80 percent of the devices. What they couldn't find, I prompted with hints, then pointed out to them. 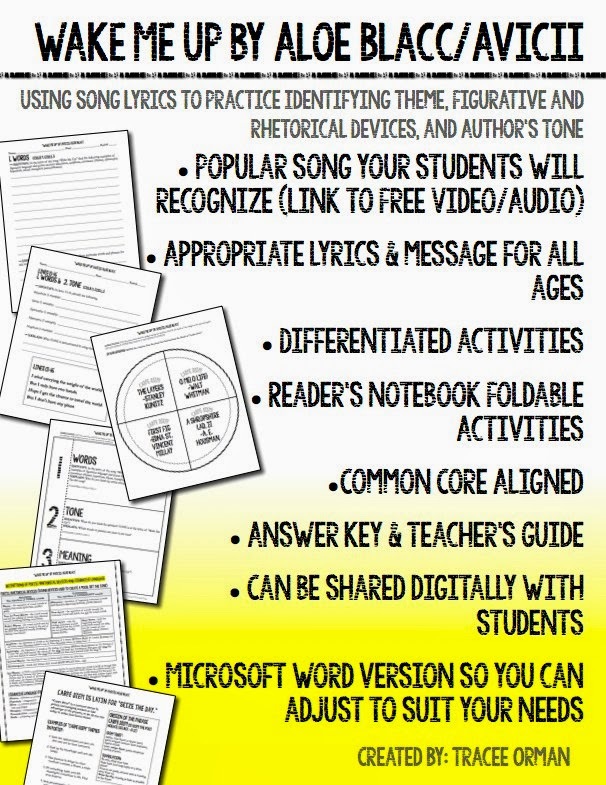 If you like this activity, check out ALL my lessons that incorporate popular music! 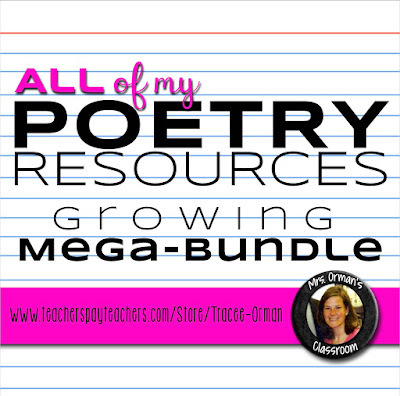 You can find ALL my song lyric activities in my Poetry Resources Mega Bundle: a collection of EVERYTHING I've created for teaching poetry, figurative language, and more. Plus, it will include everything I WILL create in the future. Get it now before the price increases! Download the UPDATED version of "Firework" on TpT HERE. Love this! I made an IMovie this year to review just this for state testing for my 6th graders! I would love to see your movie. Is there any way you can share it with me? I made a PowerPoint for my 4th grade class using your lesson! Thanks! Um, this is brilliant. Reusing for my middle schoolers. Sounds like so much fun. I'm sure your students love it! Love this idea! I can't wait to try it out! I hope your students enjoyed it! Awesome idea! Definitely using it! I've done a similar lesson with 4th graders using "Never Say Never" by Justin Bieber. 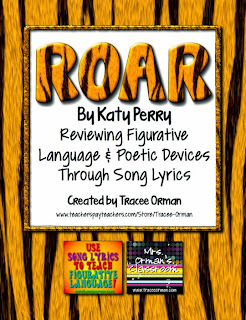 They LOVE the song and it is packed with figurative language and poetic devices! I do this with my 7th and 8th graders when I teach poetry. The easiest way, in my opinion, to get them to relate to poetry is by telling them that songs are poems. 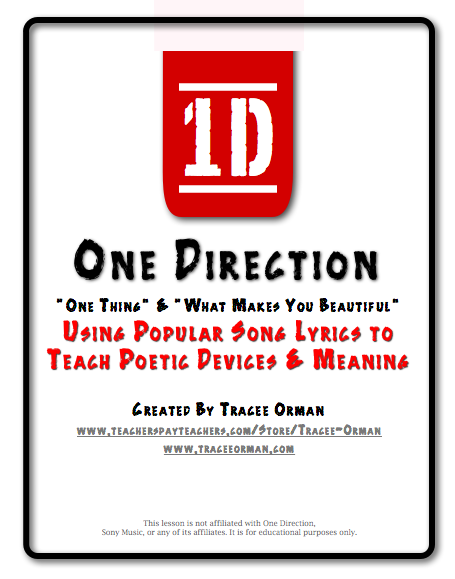 We do a project where they pick a song of choice, play it for the class, and identify numerous poetic devices. The songs have to be approved by me, but I always tell them that swears are NOT an automatic deal breaker for me. I agree 100%! :) Thanks for stopping by! just checked out the lyrics for the Jessie Jay song! woah! i would never use that in a school setting! and i teach middle school! My students really enjoyed doing this activity when i applied it on my figurative language lesson! Thank you so much! So glad! Thanks for stopping by! Can't wait to try this out! My kids will love i! Seriously, this is why the education system is the way it is these days. Why do so many interesting lesson links go back to "paying" teachers? Even if you don't post this, you should know that I share every lesson with every teacher. Students first, not profit. I think what is wrong in education is that teachers are underpaid for the amount of work we do. Perhaps if we were paid for all the roles we perform, including writers (though many teachers are not writers and are more than happy to purchase textbooks and materials from others), we would not have to get second jobs. I love to write and do not feel that I should give the books and other materials I write/publish away for nothing. I've spent hours outside of my normal workday on my craft. 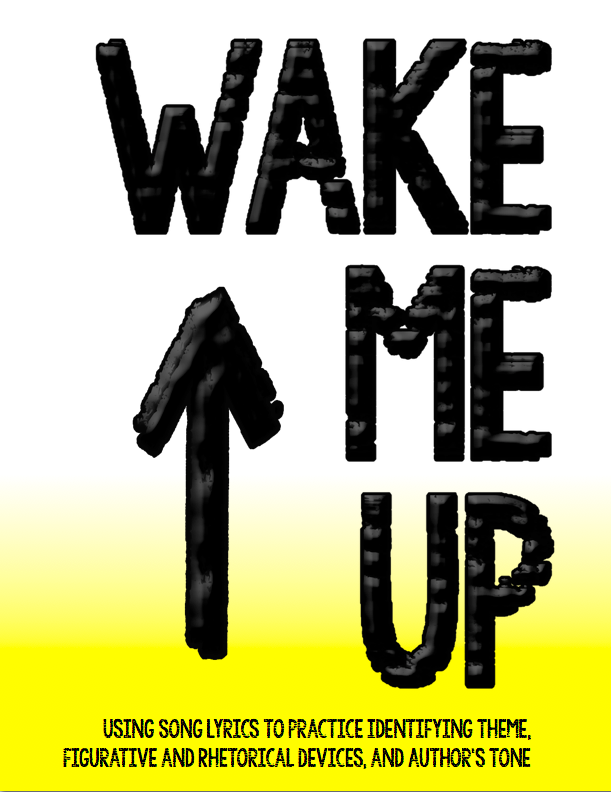 And I have close to 100 free downloads, including THIS one, so I do believe in giving/sharing. My students also benefit because everything I make goes right back into my classroom in the form of books, supplies, food, etc..
Have you never purchased anything for your classroom, or do you prefer to fill the pockets of CEOs rather than teachers who are using that money in their own classrooms? Personally, I would rather purchase from teachers because I know that money will directly benefit students. Ultimately, I think teachers need to respect their craft; and we can't respect what we do if we place a $0 value on it. We have no argument for higher pay if we think what we do has no monetary value. I believe students come first. But if teachers don't believe in themselves, how can they believe in others? I agree completely Tracee! Though I've never sold anything on TpT, I frequently purchase lessons, and I'm happy to pay someone for their hard work and creativity. What a great idea! Thanks for sharing! I have visited your store tons of times and appreciate all the hard work and effort that you put forth into your activities. Your students are the true winners I bet! Thanks, Wisconsin Workers! I know you guys have been through rough times these past few years and we appreciate all YOUR efforts! Hang in there! Love the concept! Students respond to lessons like this! As far as "anonymous" being upset about a paid product made by a teacher, I would ignore it. Big corporations like Pearson and others are making a gold mine driving the Common Core Standards creation and obvious roll-out of their Common Core aligned resources. I would much rather buy from a teacher in the classroom then from a large corporation that's sole reason of existence is for profit. Tracee - Thank you for a great product! We are going to be hitting figurative language hard in the next few weeks (again!) and I know this lesson will truly be appreciated by my students. As for "anonymous" - my students do come first. Every year I spend over $1,000 in my classroom out of my own pocket. I buy classroom supplies, books, rewards, and so many other things. Our government currently allows me to deduct $250 for tax purposes. Where do I make up the other $750+? I sell on TpT so I can give back to my students while still paying off my own loans. (Grad school wasn't cheap!) I don't judge what you do in your spare time, so please don't judge me for helping other teachers. I create engaging, creative lessons that make planning and teaching a little bit easier for myself and others. There are so many holes in the educational resources that can be used for our students. If a teacher creates materials to fill that void and receives compensation for it, I have no problem at all with that. I would sooooo much prefer to pay a teacher who is actually working with his/her students for their ideas than a corporation that is in it solely for the profit. Teachers paying teachers is such a wonderful way to reward teachers for their hard work and to provide excellent resources for those teachers who may not have the time or inclination to create them. Teachers work evenings, weekends, after school, and the summers with little or no additional pay for their time. This is a wonderful way for hardworking teachers to supplement their income. Thank you, Tracee, for providing such excellent resources! Teachers who put their students first are always spending money (as little as they have) to help the students learn. I would much prefer to pay a teacher than pay a company. Tracee, what a great way to connect to the children's brains in a way that will help them remember! Thanks for stopping by, Sally, and for your kind words! I really appreciate it! It seems anon. has some unfortunate misconceptions about a teacher's role. Our job is to provide for our students, their families, and our school a paid service based on our expertise. That expertise is a valuable asset that with focus, drive, and ambition can be used to not only help students across the globe, but to help other teachers do their own jobs more effectively, efficiently, or both. I would argue that the problem with education has nothing to do with teachers who tirelessly create practical and usable materials on their own time nor the teachers who appreciate and value that work due to its time and energy saving benefits. Instead, I'd argue that the actual problem is the viewpoint expressed above: that teachers ought to be quiet and that their expertise be unappreciated for fear that they value profits over children. I can assure the world that any teacher who takes the time to create a product, paid or otherwise, isn't the kind of teacher that anyone needs to worry about. It is that passion for children that leads them to spend thousands of hours a year making those products. Teachers should be free to succeed and excel, especially when the result enriches their communities and their students, as well as teachers and students across the world. Free enterprise is a system of voluntary exchange. There is not another profession whose members would be chastised for being a part of it. Teachers shouldn't be either. Well said, Kate, and I could not agree more with you. Thank you!